I mentioned the other day that we hosted a little get-together for my mom’s birthday this past weekend. 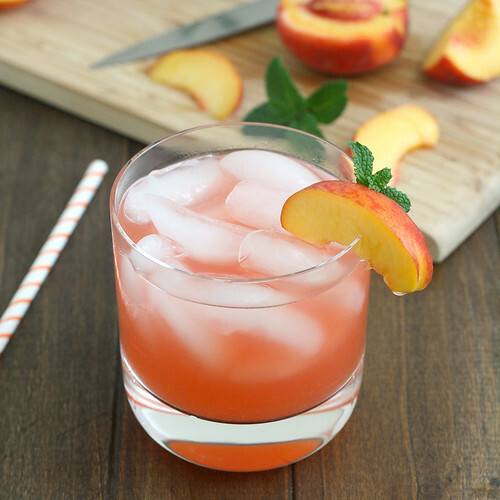 Shane and I had come up with a pre-party to-do list – mostly cleaning and shopping that needed to be done and dishes that could be made in advance, including this peach lemonade. So, consider this your advance warning – plan ahead if you want to serve this lemonade! And you’ll want to, trust me. It’s super easy; you infuse a simple syrup with peach flavor, then stir the mixture into freshly squeezed lemon juice. The result is not too sweet, and wonderfully refreshing on a hot summer afternoon. Serve as-is for kids, or add a splash of alcohol for adults – you can’t go wrong either way! Add the water, peaches and sugar to a medium saucepan. Stir to combine, then set the pan over medium to medium-high heat. Bring the mixture to a boil, then reduce the heat and simmer for 3 minutes. Transfer the mixture to your blender and let cool for 15-20 minutes. Remove the center piece from your blender’s lid (to allow the steam to escape) then replace the lid. Place a kitchen towel over the opening and put your hand on top of the towel, then blend the peach mixture until smooth. Strain the mixture through a fine mesh sieve lined with cheesecloth into a heatproof bowl. Discard the solids. Refrigerate the strained mixture for at least 3 hours. Right before serving, stir the lemon juice into the chilled peach syrup. Add 1/2 cup ice to each glass and top with the lemonade. Garnish with peach wedges, if desired. 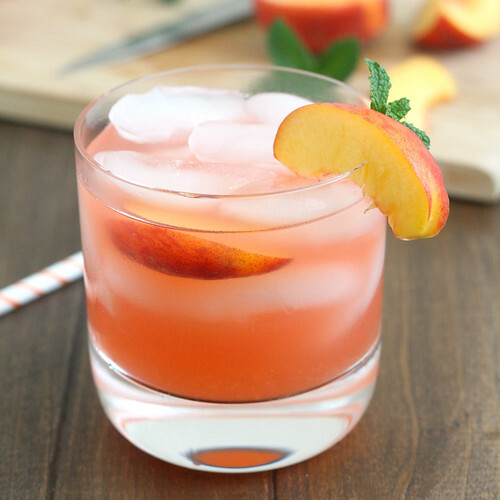 17 Responses to "Peach Lemonade"
So pretty! I have tons of peaches & nectarines to use – great idea! I love creating lists too! And this lemonade – looove it! I’ve been meaning to make lemonade for the longest time! And don’t worry about the refrigeration problems you keep runing into – I run into the same thing all the time! I lost count how many times I didn’t read the entire recipe just to find out in the middle of it it need extra time, or an extra step or something. I love peach lemonade. It’s so good and refreshing and summery 🙂 Yours looks delicious. Yum! This looks so refreshing!! I made Peach Lemonade earlier this week too! Yours looks so pretty! I showed this recipe to my 22 year old son yesterday and he demanded (okay, begged) I make it! He wanted to mix it with iced tea – I called it a Peachy Palmer, but he also loved the peach lemonade on its own. Looks so good! I love it. Great minds think alike! :) I posted about this yesterday too. It’s such a refreshing drink and not too tart! Your pics look great! This looks absolutely delicious and I adore peaches! 😀 Cannot wait to try this recipe and share it with all my friends! These photos are so beautiful! And I bet the drink was super refreshing. Looks very yummy! Can’t wait to try it.